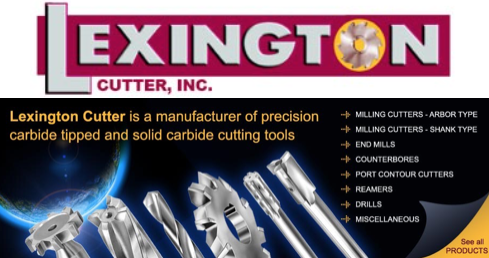 Lexington Cutter, Inc. is a manufacturer of quality precision carbide tipped and solid carbide cutting tools. They are an ISO certified company. Their products are used primarily in metal removal; aerospace, automotive, construction and farm equipment. Additional uses are found in high abrasion materials such as fiberboard, resins, composites and some plastics. They pride themselves on being a leader in manufacturing and striving for excellence in every tool. Flute long carbide tips braze to one piece alloy steel bodies. Straight polished flutes. Designed and manufactured for maximum tool life. Expansion reamers are recommended for reaming abrasive materials and as the diameter wears down, the reamers can be expanded many times by tightening the end adjusting screw and regrinding to its original size. Expansion reamers should not be considered as adjustable for use in producing holes of several sizes.